1. For the mayonnaise: place the piccalilli in a container and, using a hand blender, blitz until smooth then fold into the mayonnaise. Add the chives and season with salt and freshly ground black pepper then set aside. 2. For the sauerkraut: place a little oil in a pan over low heat. Add all ingredients into the pan and sweat on a low heat for 8-10 minutes to allow the flavours to infuse. Remove from the heat, season with salt and freshly ground white pepper and allow to cool. 3. For the caramelized onions: place the oil in a pan over medium heat, add the onions and a pinch of salt. Continue to cook for 15 minutes or until the onions are soft and brown in colour. 4. Cook the sausages on the preheated barbecue and turn regularly until fully cooked with no pink meat (about 15 minutes). Cut the hot dog bun in half and place them cut-side down on the barbecue for 15–20 seconds to toast. Cook the bacon on the barbecue for 2-3 minutes, until cooked and crispy. 5. 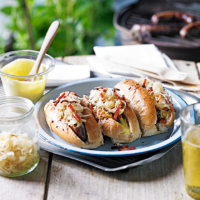 Serve with the sausage in the toasted rolls, topped with sauerkraut, caramelised onions and the piccalilli mayonnaise. Finish with a sprinkle of the chopped bacon.